Mood’s viscose jersey is so soft and comfy. It feels like you are wearing pajamas. This lovely fabric comes in five dreamy colors. Something for every complexion. I chose soft bisque; it’s a perfect neutral that can be paired with almost any color. I used Simplicity 8131 to make this top. The pattern is for woven fabrics, but works well with this light weight knit fabric. I don’t always follow the recommended fabrics. Making my own clothes gives me the freedom to choose my own fabric and pattern combinations. 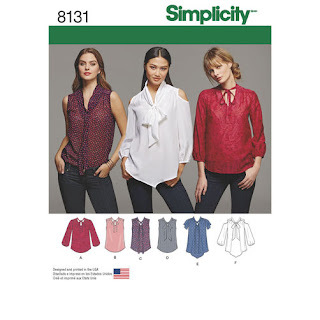 This pattern is described as: misses’ pullover blouses with sleeve and bow tie variations. Kind of vague as usual. But nevertheless, Simplicity provides decent illustrations of the blouse. So you get a good idea as to how the blouse will look. It comes in sizes 6 to 22. I used size 14 with modifications. There is nothing difficult in the instructions. Typical. I brought this pattern for view F. But this first time around I made view A. This is my test to see if this top works for me. I must admit I do like it better belted. My only real dislike is the facing. It flips out and is visual through the blouse. No biggie, just a small dislike. I made a few of my usual alterations: full bust adjustment and prominent shoulder blades. I didn’t add a bust dart. Half of the excess was ease into the side seam and the rest rotated to the gathers near the shoulders. I plan to make it again in a red viscose batiste. This is an easy blouse to sew and I do recommend it to others.